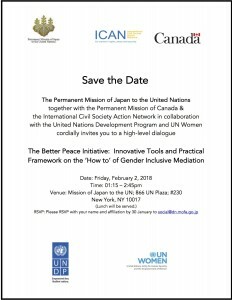 We are excited to partner with the Permanent Missions of Japan and Canada to the UN on this interactive high-level dialogue showcasing our Better Peace Initiative (BPI) framework, and latest animations. Our longtime partner and supporter of BPI, the United Nations Development Programme (UNDP) will be moderating the discussion. 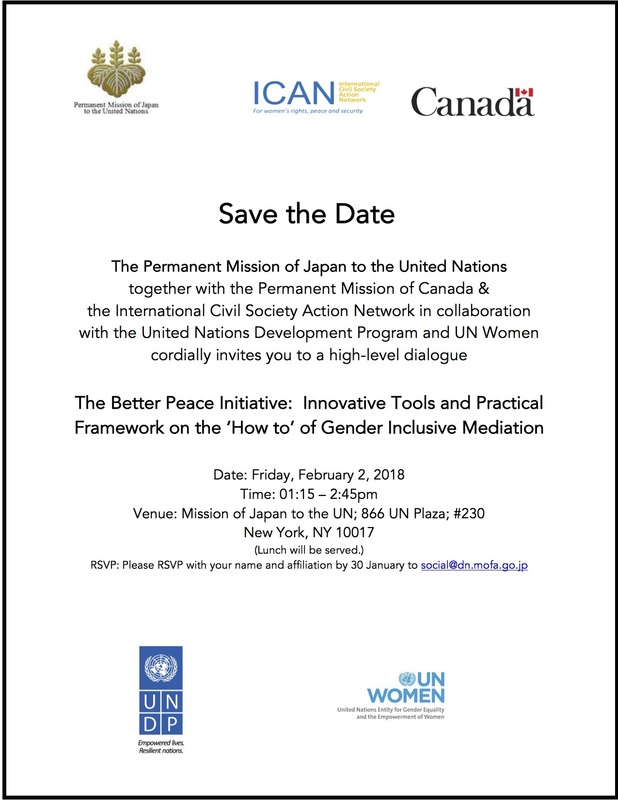 The event will be held at the Mission of Japan to the UN (866 UN Plaza) on the 2nd of February 2018. This dialogue will provide policy makers, mediation experts, and civil society actors with the opportunity to advise on priority themes for forthcoming tools. We will also share plans on upcoming tailored seminars and capacity building work. We are incredibly thankful to all our collaborators – the Permanent Mission of Japan to the United Nations, the Permanent Mission of Canada to the United Nations, the UNDP and UN Women!